This is the essential Music Together® class, one that a child can attend from birth through age five - and through all nine song collections. Child development researchers recommend mixed-age groupings because they foster natural, family-style learning. Younger children enjoy watching and imitating older ones, older children learn by leading younger ones and adults are happy because the children in the family can go to class together. Each child participates at his or her own level in singing, moving, chanting, listening, watching, and exploring musical instruments. The class provides a variety of adult-child activities that are fun and offer new ways to play musically at home. Parents, grandparents, or nanny accompany the children individually or together. The whole family is welcome for this important family music experience. Although most three and four year olds thrive in a mixed age environment, we do have another option for your family. 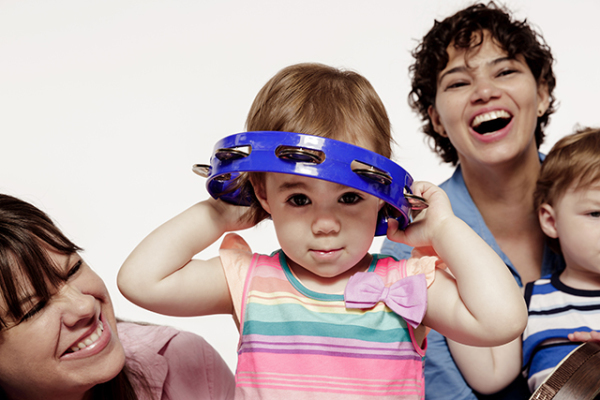 ​In this Music Together family-style class, which still looks very much like a mixed-age class, you and your child may experience additional musical activities such as rhythm improvisation, independent singing, dance improvisation, and dramatic play. Teachers work with individual skill levels and interest. Younger siblings are welcome to attend the 3s/4s class with their older brothers and sisters. Copyright © 2017 The Music & Play Station​​® / Jump Into A Book!® All rights reserved. Music Together® art & logo design © 1992-2017 Music Together LLC. Music Together is a registered trademark.